The BJJ belt system shares some similarities with Judo due to the intertwined history of the two martial arts. There are 5 common BJJ belts that go from white to black. The awarding of belts in BJJ is done much more conservatively than in other martial arts. As a result BJJ Belts are typically hard earned and a source of pride for most people. The requirements on each belt level depend on the school and the professor but there are some generally accepted requisites that seem to be adhered to universally. In general the awarding of belts is done at the instructor’s discretion. The most common belt in BJJ. It is the belt that you wear in your first ever BJJ class and is the first step on the ladder. White belt is where you learn the fundamentals and develop a basic understanding of the key concepts of the marital art. It is when you build your initial defensive skills. White Belt level is also where you will find the biggest discrepancies in terms of skill level. This is because there is a vast gap between a four stripe white belt and someone who just walked in for their first class. Blue Belt is the 2nd belt in the BJJ ranking system. At blue belt you will learn a large number of techniques and positions. According to the IBJJF a practitioner must be at least 16 years old to receive a blue belt. This period will also be a time of experimentation as you test out different types of techniques. In this regard blue belt can be very exciting as it is also the time where you figure out your own style of BJJ. For example, you may discover a preference for a particular type of guard and can begin adding techniques and attacks that go along with that type of guard. Blue belt is also a time when many people stop practicing BJJ. There are many reasons for this but it seems that many people are content with the achievement of a blue belt promotion and then decide to step away from the martial art. Purple belt is the 3rd step in the BJJ ranking system. At purple belt you will begin the process of refining many of the techniques that you have already learned. At this stage you will most likely have established your favorite game and will be looking to refine your skills. At purple belt you may not have perfected every technique but will at least have an awareness of most techniques. Purple belt can be a frustrating period for some as they find the rate of improvement slower than the previous two belts. However this can avoided by mixing up your training and doing a little more experimentation. The IBJJF requires students to be at least 16 years old and recommends they have spent a minimum of two years ranked as a blue belt to be eligible for a purple belt. At brown belt you are almost an expert in BJJ. You should have a well rounded game and be proficient in a wide range of techniques. As a result you should have multiple options for each position that you find yourself in. At brown belt the focus should be tightening up your technique. Increased focus on fundamentals and concepts may be required to take you to the next level. The IBJJF requires that students be at least 18 years old and recommends they have spent a minimum of 18 months as a purple belt to be eligible for a brown belt. A black belt in BJJ means that you have reached an expert level of skill and learning in BJJ. A black belt is a massive honor in BJJ and is only achieved through thousands of hours spent on the mat. Achieving a black belt in BJJ can take up to 10 years for the average practitioner. However black belt does not signify the end of learning, in fact the opposite is the case. When people receive a black belt they are often told “now the journey begins”. The journey is different for everyone but continuous learning and personal development will be central to the journey. Unlike the other colored belts Black belts do not have stripes added. Instead Black belts can receive degrees. The IBJJF requires that a student be at least 19 years old and recommends they have spent a minimum of 1 year ranked as a brown belt before promotion to b lack belt. This belt does not really belong on this list and is not a realistic goal for 99.99% of BJJ practitioners. It is awarded to people whose influence and fame takes them to the pinnacle of art. The awarding of this belt can be quite political depending and may depend on their team, and belt lineage. Since it can take a number of years to achieve a promotion most academies and schools use stripes on belts as a way of rewarding progress. Up to four stripes can be added to each belt up to brown. 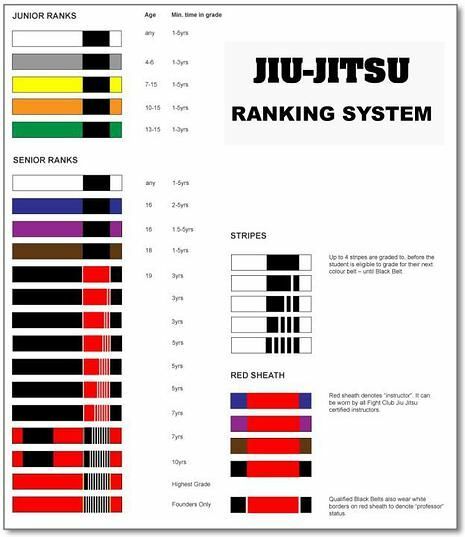 Since blue belt and higher have age requirements the ranking system for children is different. At juvenile level the belts are as follows: White, Yellow, Orange and Green. These belts are utilized until age 16 and each belt can have up to four stripes. This question is very subjective and you will get very different answers depending on who you ask. Belts in general do matter. They are representative of time spent on the mats and generally signify a particular level of competence in BJJ. However there will always be discrepancies in belt systems between academies and even within academies. For example a world champion Purple belt will most likely be significantly better than your average black belt. Age is also a factor in belts. A 20 year old newly promoted black belt will have a significant athletic advantage over a 40 year old newly promoted black belt. This extra athletic ability means that they will have more options in terms of technique and will also most likely have an advantage in terms of recovery. In recent years the rise of nogi has also made the belt system less relevant. Some BJJ schools such as Eddie Bravo’s 12th Planet do not roll in the Gi at all but still use belts as a grading system for their students. The difference in Gi and nogi techniques and skillsets means that it is hard to compare students of the same ranking. Even this topic is controversial and is the source of regular debate. There are a few different ways to tie the belt. Despite what many people say it seems there is no one correct way to tie the belt. In the following video Rener Gracie demonstrates his preferred method.